While doing a search through old newspapers today I was surprised to stumble upon this unique Houdini item. This clipping is from the Trenton Evening Times Newspaper in 1895. Appearing that week at the Trenton Museum was J.H. Houdini. My first thought was perhaps it was a typo and they added a 'J' to the name. But then I remembered that there was a J.H. Houdini who was one of the original two Houdini Brothers. This was Jacob Hyman. Jacob is credited with being the person who actually came up with the name HOUDINI. Young Erich Weiss was telling his friend Jacob all about this great French conjurer Robert-Houdin that he'd been reading about. Jacob told him, that by adding an 'i' to the name it would mean 'like Houdin', thus the invention of the name Houdini. Jacob went on to become the partner in the original Houdini Brothers act in 1891. But for how long is in question, because by May of 1891, Jacob enlisted in the Army and was there until 1893. While away, Joe Hyman took over the role. In 1893, the original Houdini Brothers, Jacob who was now out of the Army, Harry, along with Dash, Houdini's actual brother were performing at the Chicago World's Fair. 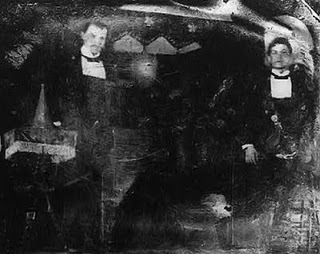 This photo is J.H Houdini and Harry Houdini, (Jacob & Erich) at the Chicago World's Fair standing in front of the Metamorphosis trunk and curtain. Their partnership lasted until 1894 when Jacob decided to go out on his own. Harry then teamed up again with Joe Hyman, Jacob's brother, and then with Theo (Dash) who was Harry's brother. All of this happened over a six month period because in June of 1894, Harry met Bess Rahner and married her and the Houdini Brothers got dumped in favor of 'The Houdinis'. We know a lot about Harry Houdini's history, but less about the other 'original brother'. It turns out that Jacob, continued to perform as J.H. Houdini, though at some point switched to J.H. Herne. His brother Joe joined the act and in 1897 they were presenting 'The Startling Theosophical Illusion SUBSTITUTION', which was their name for the Metamorphosis trick. Jacob appears to have gone back to J.H. Houdini, probably as Harry was gaining fame. At one point he even billed himself as 'The King of Handcuffs'. It's hard to say if Houdini was even aware that his old friend was still using the name at first, but by 1903, Harry was more than aware. He had been been trying to get Jacob to stop using the name HOUDINI, but to no avail. So Harry sent his brother Leopold, along with their lawyer and a pair of 'king breakers' (handcuffs that cannot be opened) to one of Jacob's shows. Being the 'Handcuff King' J.H. Houdini challenged people to bring their own cuffs. So Leopold went onstage and locked Jacob in the 'king breakers' and he was unable to open them. The embarrassing incident was followed with the threat of continued harassment unless he agreed to drop the name 'HOUDINI'. Sometime later, Jacob Hyman dropped the name. He actually got out of show business altogether and went into medical school at Ohio State University. Whatever troubles were between Houdini and Jacob must have been forgotten over time. In fact, in 1906, Harry presented a new effect called "The Prison Cell & Barrel Mystery" using the very same barrel that Jacob Hyman used in his act. I'm guessing that Houdini may have purchased the J.H. Houdini show and props to help Jacob pay for Medical School, again, that is only a guess on my part. 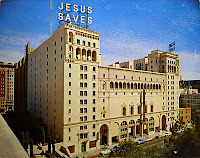 After becoming a Doctor in 1911, he relocated to the Los Angeles area and became a prominent Beverly Hills physician. He also married Lyda Wilcox, who had been a Silent Era movie star known as Dorothy Dale. Her movie career ended after making the silent movie version of The Ten Commandments. The movie make-up she wore had damaged her skin and her show-biz career was over. At some point later in life, Dr. Jacob Hyman converted from Judaism and became a Protestant Baptist. He also became a minister and would preach at the famous Church of the Open Door. One topic he preached on was 'Is Jesus Israel's Messiah?' which leads me to believe he probably considered himself what is called a Messianic Jew. 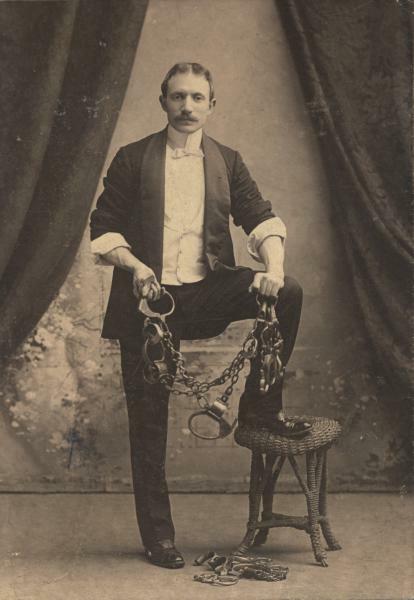 Jacob Hyman, the man who came up with the HOUDINI name died in 1942. His wife Lyda, also known as Alida, became a recluse later in life. She died tragically in a fire in her Los Angeles home in 1957. I see other references in AskAlexander that the Philadelphia was in New York (not Pennsylvania). You know, I have several clippings related to his wife's death among "The Culliton Papers." Pat has done great work on uncovering Hyman. BTW, I think he and his wife are buried in Hollywood Forever cemetery. I know Jacob is buried in Forest Lawn Park, not sure about the wife. I'm glad you liked it. This blog was a lesson in the right and wrong way to research. I dug and dug for this information and then when I had it all gathered up and thought I found some revelations, I opened up Patrick's book and there was most of what I'd found, though it was scattered over a number of places. Still, the research is half the fun.